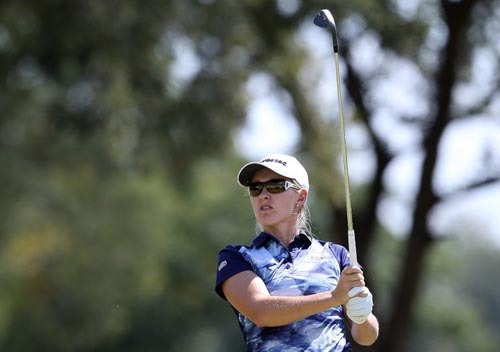 Breezy conditions made for difficult scoring at San Lameer Country Club, but Germany’s Laura Fuenfstueck put together a well-constructed 69 to top the second round leaderboard in the SA Women’s Masters on Friday. The 23-year-old Fuenfstueck opened up a two shot cushion on five-under 139 over Scottish amateur Gemma Batty and she finished three strokes clear of South African duo Lejan Lewthwaite and Melissa Eaton. The Sunshine Ladies Tour rookie was not alone in struggling in the wind. Only 12 players in the field of 78 managed to break par and just seven finished in red numbers, but Fuenfstueck knows she is in a strong position heading into the last day. “The day started nicely again, but the wind came up and it makes a big difference to this course,” she said. “I hit all the fairways and I positioned myself really well into the greens. But you’re hitting it uphill and downhill on uneven lies and the course is so tight. 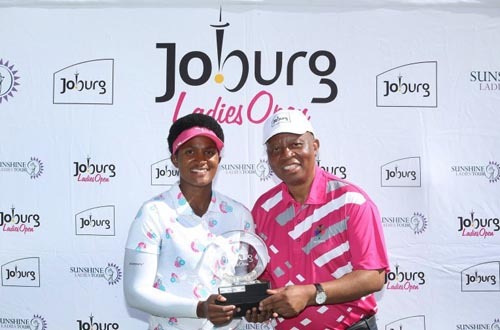 Fuenfstueck travelled to South Africa to gain competitive experience on the Sunshine Ladies Tour before she starts her season on the Ladies European Tour (LET) and LET Access Series. Batty carded a two-under 70 and was over the moon to find herself in second place after 36 holes. “I never expected to be at the front of the field; it’s all new experiences for me,” said the 23-year-oold Scottish Golf Women’s National Squad player. Batty could become the first amateur to win on the Sunshine Ladies Tour since Ashleigh Buhai (nee Simon) won the South African Women’s Open at Durban Country Club in 2007, but not if Lewthwaite has anything to say about the outcome. Eaton was happy to fly below the radar as she quietly worked her way up the leaderboard with five birdies and two bogeys, but don’t be surprised if the crowd favourite walks in the winning putt at 18 for a second Sunshine Ladies Tour title.